Another Pop-Up Going Up in the Neighborhood | Park View, D.C. If you haven’t been at the southern end of Warder Street recently, you probably haven’t seen the pop-up at 423 Columbia Road. It is located right where Warder, Columbia Road, and Michigan Avenue come together and the house faces McMillan Reservoir. The Office of Planning is currently proposing some Zoning changes in R-4 Zones that, if implemented, would impact both building height and the number of units allowable in row structures. I’ll write more about that when I get a copy to the most recent version of Planning’s proposal. This entry was posted on July 29, 2014 at 7:01 am and is filed under Architecture, Development, Housing. You can subscribe via RSS 2.0 feed to this post's comments. I’m happy to see the continued investment in the neighborhood! Its fugly and looks odd. yes, investment in neighborhood is good, but the mid-term effect of this kind of investment is negative. in our residential neighborhood with lots of young families, I’m more concerned about the number of units allowable in row structures than about the pop-ups. The one above is indeed fugly, but I think it’s great to have the (expensive) option of adding 800 sqft to your home without losing yard space or moving. 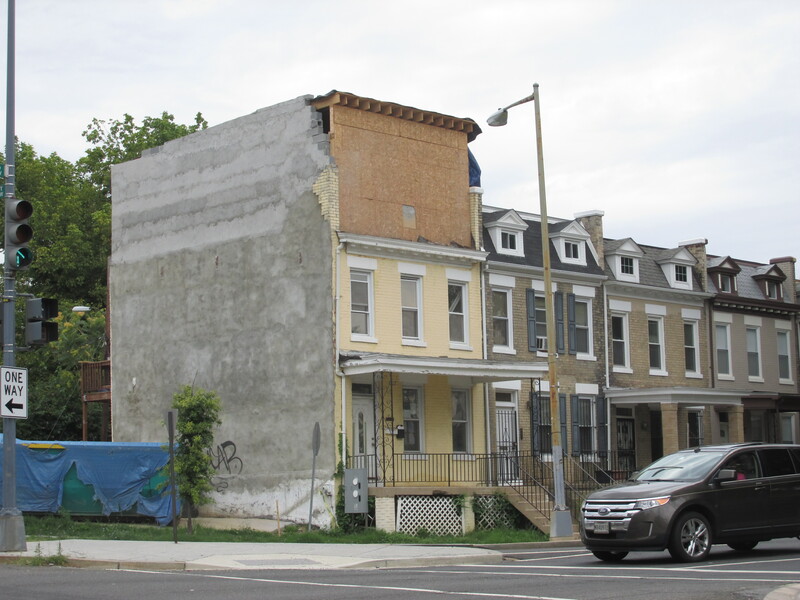 On the other hand, I hate seeing a rowhouse turning into a 3-unit condo or apartment building. hard to say its ugly when its not even finished. would like to see better design guidance and standards for pop-ups, not banning them or putting restrictions as OP is now seemingly proposing, but look forward to being more informed on it in the future post. In a sense, DC has already so many pop-ups that putting the brakes on them now would create neighborhoods with inconsistency, a popup every so often with the rest row homes. This is just going to raise the cost of housing even more, leaving DC’s row houses for the rich and inaccessible to smaller, more affordable units. Looks like a solution in search of a problem. The new proposed law would not be stopping pop ups but rather limiting their height to 35ft. from 40 ft. I hope it’s a condo conversion. Our neighborhood needs more people and more density. I’m assuming that sliver of land (containing the dumpster) is a build-able lot b/c the row house adding the pop-up doesn’t have any windows on the side? They’ve been working on this place for at least 9 months. I think the previous occupant must have been a hoarder based on the number of dumpster loads of crap that the house has barfed up. I don’t believe that land is buildable. It doesn’t show up as a plot in the property database. Dumpsters are often filled with random peoples garbage, in fact if you left one on the street I’d bet it would perpetually be full. As for the house I hope it doesn’t look like a huge FU to the neighborhood like so many popups do. We don’t need a architrave or a frieze but at least make an attempt at a cornice people!